I'm back with my finished Halloween quilt! This turned out to be a fun quilt to put together and even though it's not October yet, I've already set it out in the family room. I mentioned in my last post that I used my Prism pattern for this quilt. I did shrink the blocks down a bit...not sure why - ha! That's what happens when I finish a quilt a year after I start it. It probably has something to do with the limited amount of fabric I had (only fat quarters of the Nightshade prints and only fat 1/8ths of the Oakshott cottons). These blocks ended up 6" finished. The quilt measures about 48" x 54". 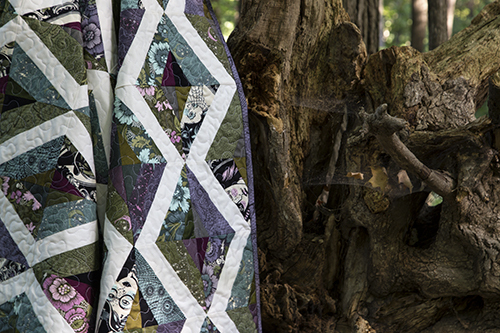 I quilted with a meandering free motion design. I did a pretty wide spaced meandering, hoping it will wash up a bit less stiff than a tighter quilting pattern. The backing is two of my favorite prints from the Nightshade line. The binding is the left over from one of the backing prints. Overall I think this is a great quilt for Halloween without screaming "Orange and Black!"